Chervil's taste is perhaps best described as a toned-down, fine and delicate version of a cross between tarragon and parsley with just a teeny tiny back-note hint of a bit of anise or mint, without either of those flavors really coming through at all. Chervil is a spring herb. It will show up in winter in warmers climates and at the end of winter in temperate climates or from growers using greenhouses. Otherwise, fresh chervil is usually only available in spring and into early summer in cooler areas. 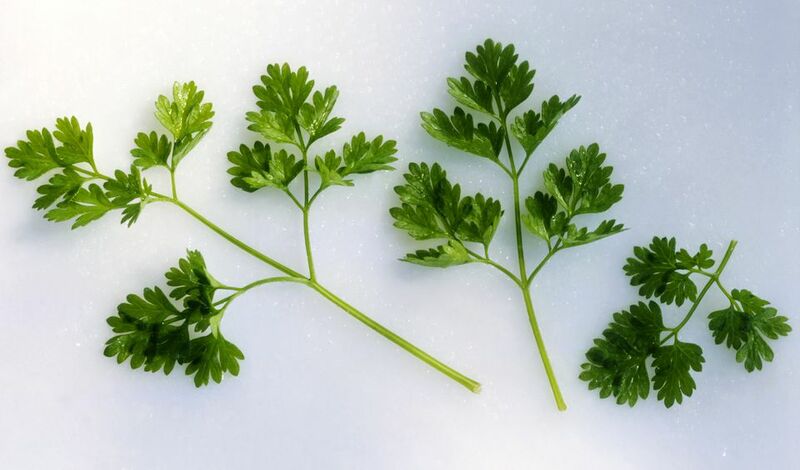 Like parsley and cilantro, heat will cause chervil to bolt, go to seed, and turn bitter. Chervil isn't as common as parsley or cilantro, however, so you'll probably need to hunt it down at specialty stores or farmers markets. If you can't find chervil at markets near you, consider growing it yourself. It is happy in gardens without too much sun or shade, a nice mix is the way to go, and can also grow nicely in a small pot on a windowsill in a classic in-kitchen herb garden. Chervil is one of the herbs used to make fines herbes (the others are parsley, tarragon, and chives), a delicate herb blend used extensively in French cooking. Chervil is particularly delicious with eggs—either added to an omelet or sprinkled on scrambled eggs. It can also bring a fresh kick when added to lightly dressed salads. On the one hand, nothing else will really taste like chervil; on the other hand, either parsley or tarragon (or, even better, a combination of the two) can add that fresh-green-herb note in a recipe when chervil is not to be found. Chives or dill, which also pair so well with eggs and delicate greens, can work well in place of chervil, even though the taste is quite different.